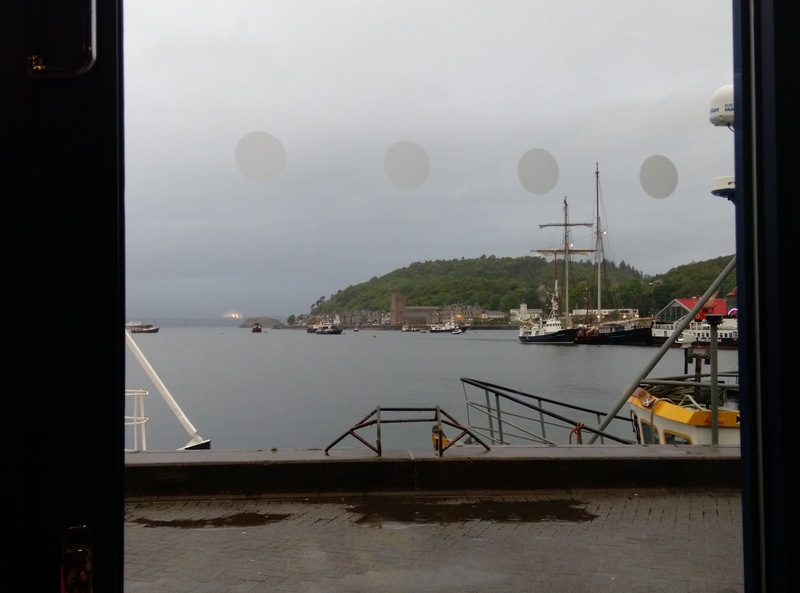 Back to the mainland (briefly) today, with the midday ferry to Oban. Nothing to report of the morning, just the usual routine of breaking camp: showers, empty the loo, ready the van, check for tyre damage after yesterday's "thump".Let's just finish last night first. We wandered across the road from the campsite to the local and most excellent pub. Found the only reliable WiFi on the island and got taking with a couple of fellow travellers. 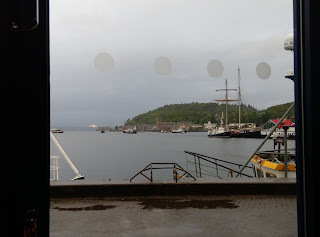 They told us where a white tailed sea eagle eyrie was to be found (we just didn't have time this morning) and also that they'd seen an otter by the campsite the previous evening. A few minutes after they left one was back telling us that if we were quick we might catch a glimpse of the otter. So pints half downed we scurried out of the pub and across to quickly catch a distant glimpse of an otter playing about a hundred yards away.Back to the pub to finish our beers. I got talking with one of the local locals. I wish we could have stayed, bought him a dram and heard tales of the isle. I'd already made a favourable impression by pronouncing " Islay" with a short A as in Africa rather than the long A as in Day. Apparently he had one American visitor seeking directions to "Ten-en-ay". Well I suppose IONA could be read that way! 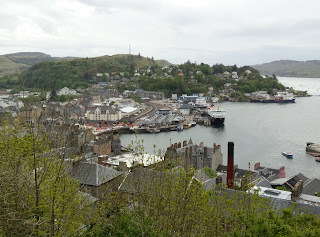 !Oban was fine, but we have nothing to do for this afternoon and tomorrow morning. We walked the shops and bought nothing other than food and newspapers. The prime problem is tonight's accommodation. There is a campsite quite a way away, in town there is a free 24 hour car park but annoyingly it is height barriered. The adjacent lorry/motorhome park wants a tenner. I don't mind paying but we are car size and being penalised for our vertical space requirements. We hunt around and all the free parking seems to have" No overnight sleeping " covenants. 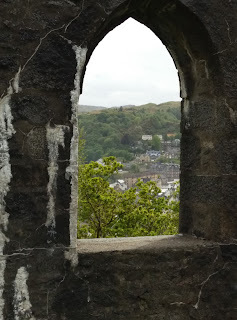 We did find free parking at McCaig's Tower but it wasn't flat and was a bit out of town. Eventually we found a private car park that was parking for the sadly closed bowling alley. £5 for 24 hours and no apparent caveats. So we park up and wander into town for a pint.McCaig's Tower is interesting. A Victorian folly commissioned by a wealthy banker who realised that many of the masonry workers in the area struggled with no work throughout the winter months. So he commissioned his folly, only to be worked on during the winter. 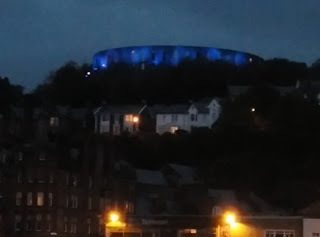 It's not a tower but a circular structure, a short of cross between amphitheatre and aqueduct. 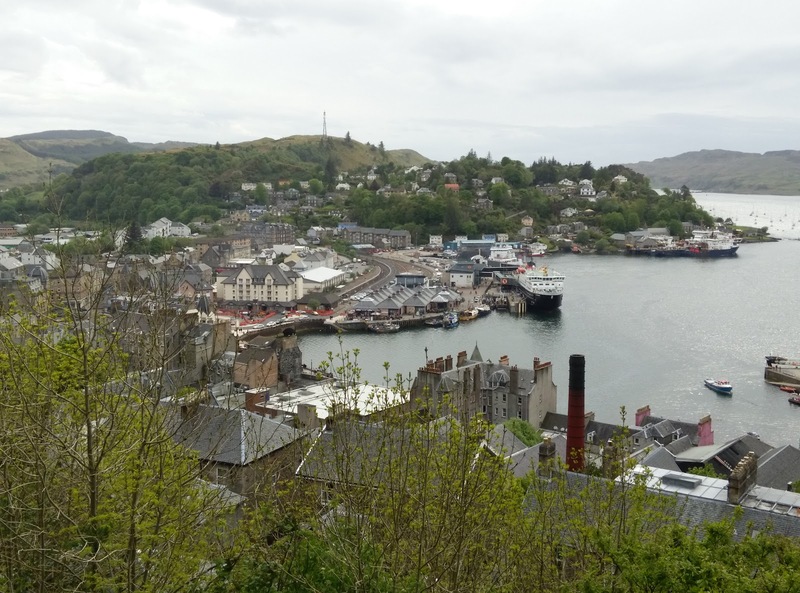 It commands a wonderful view over Oban town.Currently sitting at a window table in Wetherspoons, stealing their electricity to recharge out phones and looking out across the bay. Nice way to spend an evening!